The Hancock administration has identified 19 corridors where Denver transit should be beefed up with more frequent service, faster travel speeds, and safer walking conditions. All of those streets make sense for transit improvements because ridership is already high or is projected to grow with future development. But where should Denver start as it sets out to make a grid of high-quality transit throughout the city? Last week planners released the results of a survey that identified the five corridors Denverites think are most in need of better transit: Colfax Avenue, Colorado Boulevard, Federal Boulevard, the Broadway/Lincoln corridor, and the Speer/Leetsdale corridor. About 1,000 people filled out the survey, which was conducted over six weeks this summer, mostly online. That doesn’t mean the other 14 corridors will get left behind. City Hall wants to increase service on all of them as part of a high-frequency grid connecting all parts of Denver proper. But the survey results will inform where the city initially focuses capital improvements like transit-only lanes, traffic signals that prioritize buses, and better bus stops. On some of these streets, public agencies have already started the process of upgrading transit and walking infrastructure. East Colfax (though not West Colfax) is slated for a bus rapid transit line. Broadway and Lincoln just got 24/7 bus lanes. And the city had previously identified Federal and the Speer/Leetsdale corridor as candidates for transit priority treatments. As the Denveright planning process zeroes in on a course of action, the question of how to pay for more and better transit service looms larger. Mayor Hancock and City Council President Albus Brooks have alluded to creating a permanent funding stream for sustainable transport. How they plan to do that remains a great unknown. In Los Angeles and Seattle, public officials put special transportation taxes to a vote. In both cities, voters have recently signed off on ballot initiatives to raise tens of billions of dollars for transit. The price tag for Denver’s intra-city transit improvements should become clearer soon. The task force responsible for guiding the plan, which includes City Councilwoman Robin Kniech, will start tackling costs, funding, and implementation at its December 7 meeting. 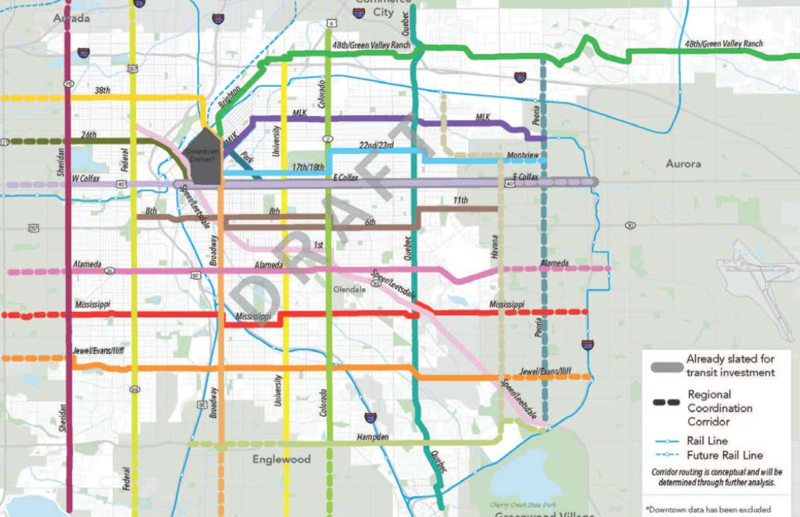 The full draft of Denver’s first-ever transit plan is due out in early 2018. The survey didn’t ask about any bus routes downtown. 15th and 17th streets really need to have dedicated bus lanes since so many routes loop through there. This question (of what to do with 15th/17th) will be studied in the upcoming Denver Moves: Downtown plan – a transportation plan for Downtown Denver. The 18 month study should begin in the next few months. Do we seriously have to wait two more years to get exclusive bus lanes downtown? It will be interesting to see what is proposed with respect to exclusive lanes? An exclusive bus lane on 17th street through the financial district could be a challenge… or not, I dunno. Seattle started with one street downtown, a dedicated lane on Pike Street between 2nd and 7th Avenues during peak hours. Last year they added an exclusive lane on Pine Street from 9th Avenue to 3rd Avenue. Right turns are generally allowed with these side running lanes. 15th street with the bike lane has frequently had two lanes closed for construction this past summer and it still functions, so really no reason not to put a bus lane there. I don’t think 17th would be any more difficult. 300-400 buses a day (currently) would seem to warrant dedicated lanes so you might very well be right. I was trying to think of one city that has taken the responsibility of transit? At least a peer city west of the Mississippi, I can’t think of any. Admittedly I know little about Chicago, Philly or Boston which are hardly peer cities anyway. The closest I could come is Phoenix which did approve $17 billion in new tax revenue over 30+ years for transportation including new transit. But even Phoenix is 2 1/2 times the size of Denver. According to Hancock’s Mobility Plan there is only $350 million needed to complete his $2 billion goal. Aside from just adding bus frequency which has questionable value by itself $350 million won’t go that far.